I posted a question I had on My windmill palm trees... Its called Two Windmill palm trees ones dying. I have two windmill palm trees or chusan palm trees and one looks like it is dying. I have looked around on the leaves and I have looked around the trunk and I have started to see some roots? Is this bad is this ok.... Some of the roots looks like it is being eatin by something? I'm not 100% sure but it looks like it. It also looks like it could be rotting? Could this kill my windmill palm. I have had them for many years now and they are about 5 ft away from each other and have been doing pretty good. My windmills have gone through many cold winters and have survived none the less with minimal damages. I would hate to replace it at such a large height. It is about 13 ft over all and has a nice trunk on it. My windmills are like my prized possession. Does any one have any idea what the problem can be and how my windmills can be saved? Any advice would help. Last edited by TreeCutter; February 18th, 2009 at 06:16 PM. I gave someone else several responses to the same question, in regards to windmill palms dying in the cold. If anyone else has any more suggestions, solutions, or corrections please let us know. Fertilize the palm trees at the end of the summer or beginning of fall. This way they absorb all the nutrients they need before the cold. By fertilizing at the right time, they 'might' not need to go into a state of hibernation at all (shrink and brown). In most cases, they will stay nice and green if they have enough nutrients stored. It's somewhat pointless to fertilize the palm tree during cold season, as a cold preventive measure. Matured windmills are more insulated to the cold, than younger windmills. Matured windmills, having past many seasons of cold, have strengthen their immune system (winterized). Wind protection; the direction the wind blows every year. Having another tree as a wind damper or positioning three closer to the house may help. Windmill palms come in many different species in the genus Trachycarpus. For example, there is the fortunei- most common. There is the wagnerianus- "most cold hardy" of all the windmills. Soil balance is also important; we will be adding a collection of palm specific soils in our online store in the spring/summer. The way the windmill palm was grown as a seedling. For example, in a container or in the field; this affects it's overall growth rate, need for the sun, and many more cold related aspects. 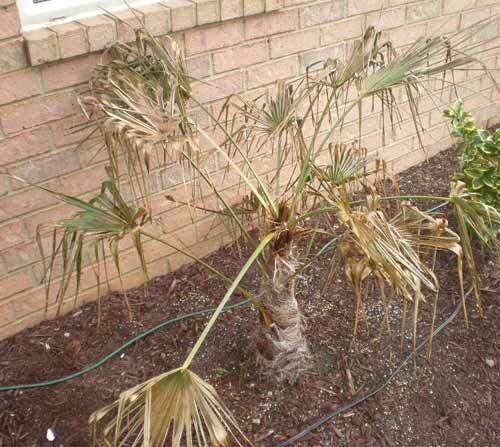 When the palm tree was transplanted also affects the cold resistance. For example a palm tree planted ten years ago will do better than a palm planted five years ago; more time to establish deeper roots. The direction of the sun in relation to the palm; if the palm tree as a seedling was grown in full sun, than it's likely it will need full sun as it matures. And obviously; disease and fungus; which is probably NOT your case. Because they keep coming back green- during the winter they are in a state of hibernation. Anyone else have any ideas or suggestions? Last edited by TreeCutter; February 18th, 2009 at 06:17 PM. Follow up on pH balance in the soil. In regards to Slide 6 below, which is the windmill palm tree dying, I have attached the following photo. Cut away all dying leaves from the bottom where the stem starts, as they might take away nutrients from newer leaves, spear, or the entire heart (center). Do a pH soil test; you can pick up a kit at almost any local garden store; Lowe’s, Home Depot, etc... Test all the windmill’s soil, including the ones in the container next to your beautiful tiki hut. We want to know what soil is in your container vs. what’s in the ground. The pH could be too high (alkaline) or too low (acidic). The target is 6.0 + (what ever your container pH is) divide by two = “average”. If your container windmills are doing good in a certain pH soil than it’s a really good idea to keep the others around the same amount of pH. Every environment is different; Florida is humid, Tennessee is moist this time a year, therefore tends to be more acidic. Even though windmill palms thrive in acidic soil, too much acidity is not good (under 5.0). SOLUTION: Once you have the “average” pH, apply or deduct soil from the other windmill palms to get them to the “average”. Remove old soil and apply lime stone to increase the pH to our target “average” or apply acidic soil (peat moss) to decrease the pH to our target “average”. Once the soil conditions are met and you have trimmed away dying branches. Cover the soil with neutral pH heavy mulch; this helps to protect the soil (roots) from the cold and keep the pH of soil from changing drastically. Slide 9 shows, yellowing which may be caused from nutrient deficiency, cold, or it could be that it was not fertilized at the right time, therefore it’s low on nutrients. Do the above. Slide 5, palm is ok- the heart looks good, has a new spear. Just follow the steps above to get it on the right track. Slide 6, palm is dying or dead; probably from the soil pH balance, cold, or it could be that it was not fertilized at the right time, therefore it has no more nutrients. Try the steps above, remove all dead leaves and just leave the trunk with heart (center), if you have to. Add a little Mychorrizal Fungi to strengthen the roots; dig holes around the soil and add Mychorrizal Fungi. Keep your fingers crossed to see if it wants to continue living- you will see the center start to turn green or a spear come from the center heart. windmill palm is one of the hardiest, as it grows at much higher altitudes, up to 2,400 m (7,874 ft) in the mountains of southern China. This brings it into a climate not only with cold winters, but also cool, moist summers. Just a bit of it backround. This is a hardy palm for sure.